Under the direction of Barb Walsh, Tintabluations Handbell Ensemble has grown into diverse group of ringers committed to the art of English Handbell ringing. A quick glance at Tintab’s roster begins to tell the tale of the groups diversity, with members ranging in age from 18 to 60+ and commuting from as far away as Lake Tahoe and Carson City. The group performs music ranging from classic church hymns to jazz and showtunes, proving that bell ringers from any age or background can turn a simple set of bells into an impressive music making force. The ensemble currently uses 4 octaves of Schulmerich handbells, plus a 5th octave of Malmark bells and 5 octaves of chimes. 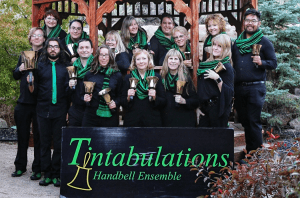 Tintabulations aims to educate diverse communities with entertaining performances that go beyond standard handbell conventions. We seek to entertain a broad, multi-generational audience with our interpretations of music from multiple genres and sources. This shall be accomplished by fostering an ensemble whose members are consistently striving to better themselves as musicians.